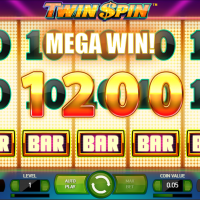 Get double the fun with Twin Spin, the new slot game from Eyecon. Leibniz’s Law states no two entities are ever the same. Twin Spin is a fine example of that. You’ll be amazed by the brilliant colours and animations lies on this classic Vegas-style slot game. Two adjacent reels will randomly spin together with the same columns of symbols. During your spin, these “twin reels” could grow to become triplets, quadruplets, or quintuplets if you’re doubly, triply, quad- you get the idea. You’ll be lucky! To make things even more interesting, you get 243 paylines to spread the money around! Bet anywhere from 0.25 to 125 coins per spin. There’s also an auto play function that gives you 1000 automatic spins. The low level symbols come in the form of 9, 10, J, Q, K, and A. 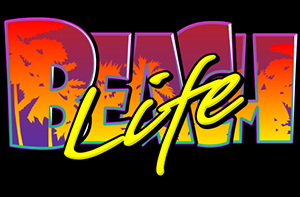 The higher level symbols are the classic Vegas cherries, bell, BAR, 7, and the diamond. That last one can multiple your stake by 1000 if you get 5 in a payline. Matching symbols in three or more consecutive reels (from the leftmost reel across) counts as a winning combo. For the Wild Symbol, you literally get a big WILD symbol. They only appear on reels 2, 3, 4, and 5. They substitute for all other symbols and increase your chances of winning. There’s also a Twin Spin Feature: for every spin, two adjacent reels spin together. The double reel combo can potentially expand into 3, 4, and 5 reels spinning altogether! If you mix all of those together with the 243 paylines, you have a lucrative game on your hands. 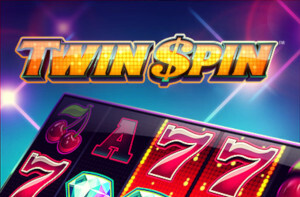 While there isn’t a jackpot on Twin Spin, you can win up to 1080 times your stake which equates to £135k with a max bet. That’s a Premier League footballer’s wage in one lucky spin! The house edge bursts in at 3.4% which is pretty decent. 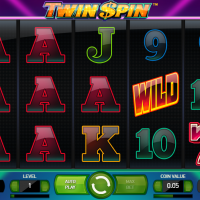 Twin Spin is one of many refashioned Vegas-style slot games on the market. That’s not a bad thing as the classic one-armed bandits are still popular in casinos, on and offline. 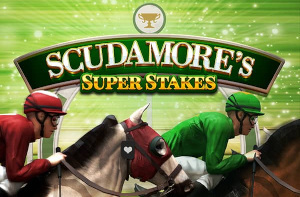 But this one is an enticing edition to the pack with its Twin Spin Feature and chance to win 270,000 coins! 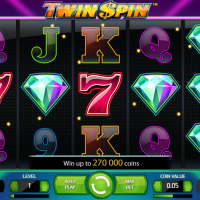 The notable advantage to Twin Spin over the standard fruit machines is the 5 reels and 243 paylines. Standard for video slots but for any newbies, it’ll be a fantastic introduction. NetEnt have delivered another high quality game in terms of graphics, audio, and winning features. 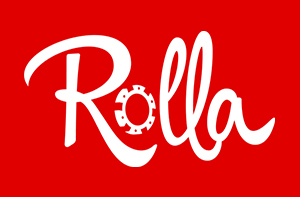 Due to the medium-to-high volatility of the game, you might need to be patient and have a healthy bankroll before you see any wins but you’ll be having plenty of fun in the process. And that’s a major part of its charm.